Murphy’s Law states that anything that can go wrong, will go wrong. Enter my world. As I said before, all of the tools in the house are mine. I also read Sandra’s entry on recommended tools for DIYers like myself- the kind who sees something and refuses to buy it because “I can totally make that”. You, too? No? I had them all with the exception of a few. Did I really need them? The answer later on would become a resounding “yes” although at the time I didn’t think so. I thought I was prepared and I was feeling pretty confident in my own abilities. I guess someone who thinks they can take on an entire room having never done even one cabinet before is somewhat crazy confident. I already had a circular saw in the garage that I had recently purchased for the doll house so I thought that I would be able to just buy a Kreg RipCut for that instead of a table saw. I really didn’t want to invest in such a heavily priced item. When I went to the store for the wood for my first cabinet I also picked up the RipCut. I bought four 4’ x 8’ sheets of pre-finished birch that were paintable on one side. When I got home I jumped out of the truck, had my kids help me unload the HEAVY sheets, set up my cutting table (that would remain in the same spot for a long time) and got to work. I measured and started to cut my very first cut for this room. Know what happened? My garbage less than perfect circular saw died mid-cut. Awesome! I was forced to drive back to the store and purchase a better one because I had no time to lose. I used the new saw along with the Kreg RipCut. That was awful, too. The cuts were not straight, there was a flaw with the device. I don’t know which one was worse, the new saw or the RipCut. Neither one was good or correct or…useful. So I built my first cabinet with the useless tools. The struggle was real, folks! I went through a whole sheet of plywood before had any decent cuts. WOW! It took me a week and I am pretty handy. That’s 6 days longer than I planned!! You know that moment when you think to yourself “what have I done”. Yeah, I’ve had a few so far. I’m pretty sure the thoughts were actually verbalized. I was so frustrated by the tools I had that I felt like giving up but I was already in too deep. I stepped away for a little while wondering if I made a big mistake trying to do this. After pouting for a while I pulled up my big girl pants and decided it was not going to beat me. My tenacity would persevere. When I finished the first cabinet I didn’t really feel triumphant because I was deflated by the failures of my tools and just happy it was done! Yes, this is what took me a week. Sandra had been telling me to get a better saw. She mentioned a few and one caught my attention. The one that didn’t need to take up the garage when I wasn’t using it as I don’t have a workshop. I had no intentions of getting a track saw. I actually had never heard of one before and I didn’t want to spend the money but up unto that point EVERY TOOL I bought was relatively inexpensive and the truth is you get what you pay for. And for me, so far Murphy’s Law applied! I didn’t want any more frustration or hassle so I did it! I got a Dewalt track Saw and it changed my new found carpenter life!!! I was so glad I invested in it and didn’t know how useful it would become. I have had small triumphs over huge hurdles so far. I finally finished the card catalog carcass and the sewing mat storage cabinet that included my first ever set of dados. I made those with my new saw, too. It was a pretty proud moment! I also made my first ever face frame. That was really hard for me. I don’t know why. I should have just built the frame as I went along, piece by piece because the card catalogs were built by hand and not “perfect”. It took me 3 tries and an entire day to build ONE faceframe! I think I was just worn out and still wondering why I decided to do this to myself. I am usually a very positive person but this was just a lot to handle. In addition to being worn out from the defeat, don’t forget that those 4 beautiful people I brought into the world were home all.day.every.day. I wanted to be able to access the outlets that the new cabinet would be covering so I called in my electrician to move all of my outlets up on the wall so I could use them from the counter. I installed this mother of a cabinet after I built the base. My new base would sit on top of the only air vent in the room so I learned how to reroute the vent which was actually very easy. Now the air comes out the front of the base and into the room. 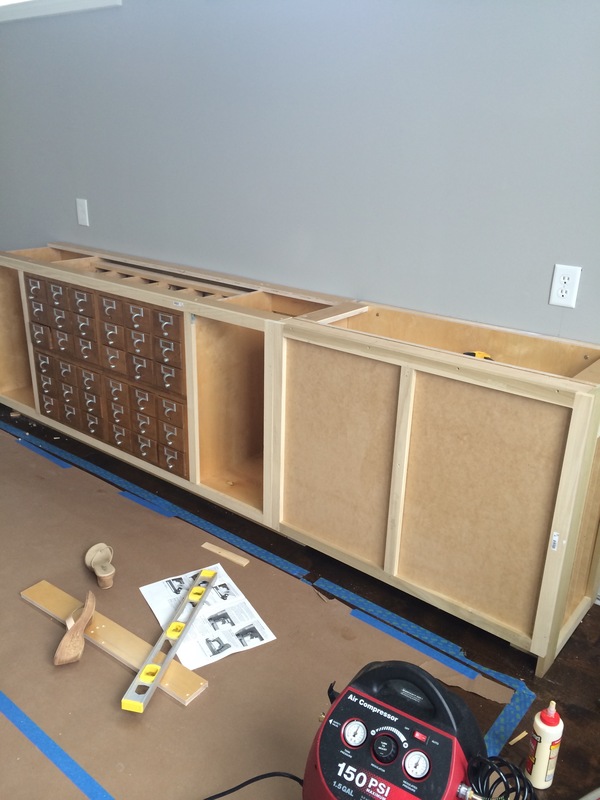 Next, I installed the sewing mat cabinet. I am SO excited! A dado is a small groove created by a saw or router that allows for the vertical pieces to slide into them creating separate sections. After that nightmare of a building experience I moved on to the 3 floor to ceiling cabinets and had some good success. My track saw was saving my sanity and my cabinets were finally level and square. It was so worth the investment. I love it! I have now started purchasing the tools recommended by Sandra when she says to do it. She really knows what she is talking about. She wrote a post about Bessey corner clamps (#lifesaver) on her blog so I just went ahead and bought them and I love them, too. They make putting the cabinet together and making it square so much easier. Especially if you’re building by yourself. It’s like an extra set of hands. I am so glad for her experiences and her willingness to share them. The cabinets are all in now and it makes me so happy. What these photos do not show you is that I drilled all of the holes for the shelf pins, brought all the wood in and assembled the cabinets only to find out that my template for the holes was wrong and I had to take everything apart and start over and re-drill what felt like a million pin holes and reassemble that cabinets. Hello again, Murphy’s Law, we are such good friends. I just want to let you know that this is really hard when the cabinets are 8’ tall! By yourself. (I really am doing this project ALL BY MYSELF! Did I mention that?) #nohelpfromhubby #allbymyslef. (Sounds like a sad love song.) It is probably quite comical to see my 5’2” body wrestle these huge and heavy cabinets into a standing position from the floor and onto a base. All that aside, I feel so good that the cabinets are square and installed! I even got the face frames in with NO trouble in a matter of an hour at the most. I had no idea when I started how much a difference of 1/32 “ would bother me or matter. I am a little bit of a perfectionist (plus cabinets have to be completely square, who knew?) so this was really hard for me to be “good enough” and not “perfect”. Sandra and I had a good talk about this. She said, “you have to choose to either be happy with good enough and be able to move on without worrying about it or torture yourself with trying to be perfect all the time. Yes it is necessary sometimes, but sometimes you just have to let it go!” I am still struggling with that one, guys. You go girl!! Cant wait to see all the stuff you do! Your a girl after my own heart! Awww Dalynn! The OG of DIY!! We were DIYing before anyone knew what to call it lol!! Thanks, Kim!! I can’t wait to see YOUR project all finished!